Australian Richie Porte (Sky) has maintained his top spot in the latest UCI WorldTour ranking, although Tour of Flanders winner Alexander Kristoff (Katusha) is threatening Porte’s position after enjoying his best season yet. Norwegian Kristoff has moved up to second place in the WorldTour table after Sunday’s Belgian success, bumping British rider Geraint Thomas (Sky) down to third. Thomas missed out on points in Flanders after finishing outside the top 10. Like Porte, Kristoff has earned points in every WorldTour race he taken part in so far this season. In addition to Kristoff’s haul after winning Flanders, he also has points from second place at Milan-San Remo, and from E3 Harelbeke, Paris-Nice and Ghent-Wevelgem. 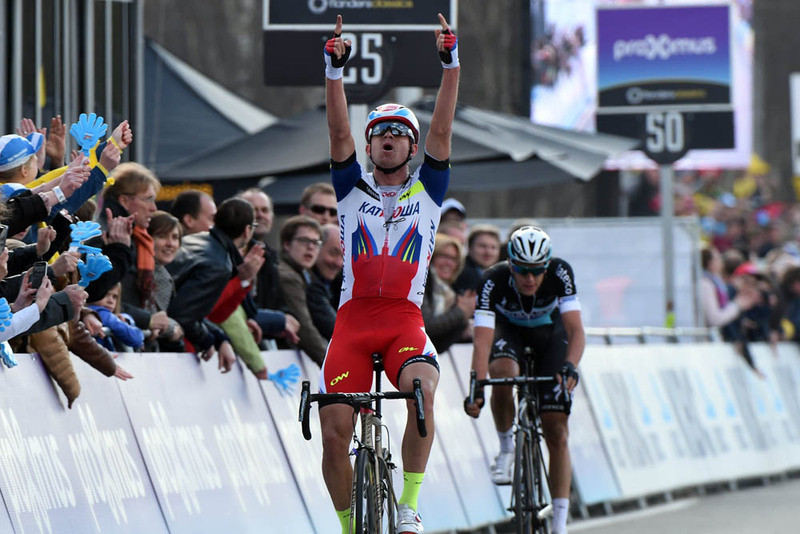 With 10 victories so far this season, no other rider has won as much as Kristoff. Flanders runner-up Niki Terpstra (Etixx-QuickStep) also moves up the table considerably, leaping from 21st in the previous week’s ranking to fourth. Porte is now aiming for success at the Giro d’Italia in May, where a good result will see him strengthen his lead in the ranking. There’s no change in the top three of the latest team ranking, with Team Sky occupying the top slot ahead of Etixx-QuickStep in second and Katusha in third. Australia also keeps it place at the head of the WorldTour nation ranking, but there’s a big shuffle around of the nations below them with the Netherlands now in second, Italy third and Great Britain slipping from sixth to eighth. The next WorldTour events are: Vuelta Ciclista al Pais Vasco (April 6-11) and Paris-Roubaix (April 12).